Ivan “Batman” Jorge is the reigning Jungle Fights Lightweight Champion. The 27-fight veteran has yet to compete in the United States, but based off the recent trend of Jungle Fights Champions, he could be on the verge of signing with the UFC or Bellator in the very near future. Jorge began his career all the way back in 2001. He went 5-0 from 2001-2005 before ultimately taking a nearly 3-year hiatus to focus solely on his burgeoning BJJ career. Jorge carved out a name for himself on the Brazilian BJJ tournament circuit, winning multiple tournaments around Brazil and Europe. In 2008, Jorge was persuaded back to the cage, and won his next 6 fights including his first international fight for the M-1 organization. Jorge’s 11-fight undefeated streak would soon come to a halt though. After dominating Russian Yuri Ivlev for much of their fight, Jorge’s cardio and striking defense failed him as Ivlev stormed back to finish the fight with strikes. Jorge returned back to Brazil and was back in the cage just 4 weeks later, claiming a decision victory over Mario Sartori. Jorge set off on an ambitious schedule of facing Brazil’s top Welterweight fighters such as PRIDE veteran Daniel Acacio and future Bellator veterans Luis Melo and Luis Santos. Jorge was able to win decisions over Acacio and Melo, which arguably made him one of the top 3 Welterweight fighters in Brazil. Jorge looked to continue his run against Santos, but “Sapo” would have none of it as he blasted Jorge with a knee, knocking him out cold. The loss to Santos may have lit a fire under Jorge as he finished his next 4 opponents, all in the 1st round. Jorge looked to rebuild his top Welterweight status by entering an 8-man, 1-night Welterweight tournament for the Bitetti Combat promotion. Jorge faced off with Welterweight prospect Andre “Chatuba” Santos in the 1st round of the tournament. After losing the 1st round, Jorge came back in the 2nd to extend the fight to a sudden death round. Santos was ultimately able to use his size and score some timely takedowns to take home the decision victory. Santos’ status as one of Brazil’s top Welterweight fighters had all but vanished following the loss to “Chatuba.” Despite being 18-3 overall, he had continually fallen short against stiffer competition. Jorge sat down with his management and decided it was time to test the waters at 155 lbs. Jorge’s results at Lightweight have been stellar. 6 fights, 6 finishes. Also, during this time, Jorge signed with Jungle Fights and has since won their Lightweight championship. Jorge initially trained BJJ with the famed Carlson Gracie before eventually making his way over to Team Tavares, which is home to a host of top-level talent such as UFC veteran Thiago Tavares, Bellator veterans Ricardo Tirloni and Nazareno Malegarie, and recent TUF Brazil 2 Finalist Santiago Ponzinibbio. The camp is stacked with talent and seems to have connections to both the UFC and Bellator. Jorge was originally born in Rio de Janeiro, and had a very tough upbringing before finding mixed martial arts and his training partners in Florianopolis. This is Ivan Jorge’s likely last opportunity to make a run at being signed by the UFC or Bellator. He was rumored to have signed with the UFC a few times throughout his career, but nothing ended up coming to fruition. Jorge’s recent claim to the Jungle Fights Lightweight title should have him on the radar of UFC matchmaker Joe Silva. Jungle Fights promoter Wallid Ismail has been a perfect bridge towards getting his champions to the next level. Just in the last couple of years he has sent over Erick Silva, Yuri Alcantara, and John Lineker. 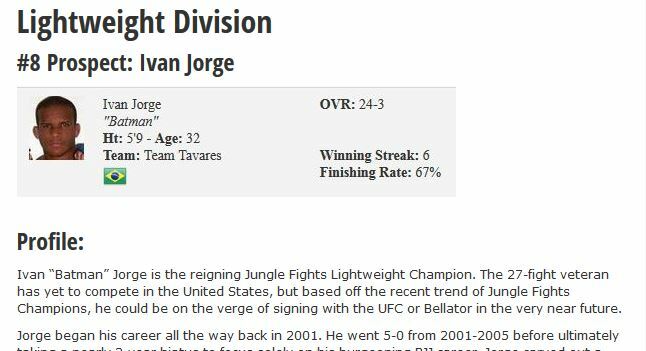 Jorge is one of the older fighters featured in the Prospects Report. He is nearing his 33rd birthday and though the recent move to Lightweight has reinvigorated his career, there are still some serious questions as to just how good Jorge would be if he were to sign with the UFC. His conditioning and striking have traditionally been his weak points. He seems to mentally crumble at times when he cannot score the takedown. Jorge’s striking has gotten better over the years, but he still drops his hands and usually leaves himself wide open for big counter strikers. Being so one-dimensional usually does not fly in the UFC, but if Jorge is able to bring his opponents to the ground, it is usually game over. Jorge does an outstanding job of taking his opponents’ back. There’s a reason why his last 5 opponents have been submitted via rear-naked choke. His opponents know its coming, but they still can’t stop it. Jorge usually doesn’t keep his fights standing for long periods of time. He is somewhat comparable to Demian Maia because of their outstanding takedown ability. Part of what has made Maia so successful in the UFC are his takedowns. People think he’s just a submission guy, when in all reality, he’s been able to take down some of the top grapplers in the division (Jon Fitch, Dong Hyun Kim). 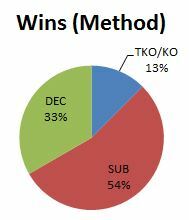 We have seen Maia wreck shop in the Welterweight division, and I believe Ivan Jorge can replicate that style to a certain degree should he sign with the UFC. Jorge is eventually going to hit a road block as he moves his way up the ranks, but for now he at least deserves an opportunity to compete on an international stage.